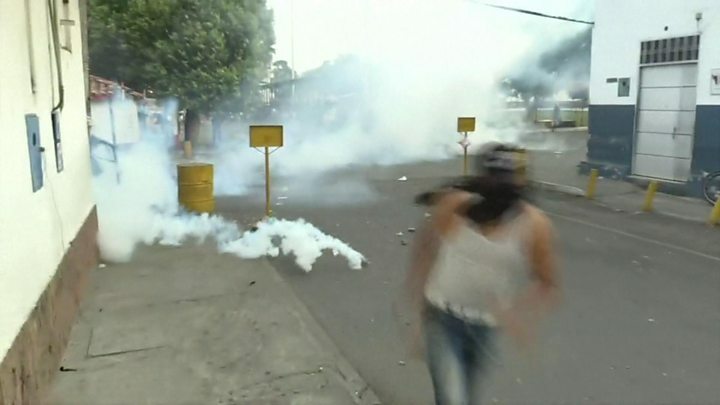 US Secretary of State Mike Pompeo has said Venezuelan President Nicolás Maduro’s “days are numbered” after deadly clashes over humanitarian aid. “Picking exact days is difficult. I’m confident that the Venezuelan people will ensure that Maduro’s days are numbered,” Mr Pompeo told CNN. Two people died in Saturday’s clashes between civilians and troops loyal to Mr Maduro, who blocked aid deliveries. Self-declared interim President Juan Guaidó said Mr Maduro must resign. Mr Guaidó also called on other nations to consider “all measures” to oust Mr Maduro after opposition-led efforts to bring in aid descended into clashes. Mr Guaidó said he would attend a meeting of mostly Latin American countries in Colombia on Monday, despite being under a travel ban imposed by Mr Maduro. US Vice-President Mike Pence will represent Washington at the talks in Bogota. Meanwhile, Colombia and Brazil said they would intensify pressure on Maduro to relinquish power. US President Donald Trump has not ruled out an armed response to the Venezuela crisis. Mr Guaidó last month declared himself interim president and has since been recognised by more than 50 countries. He argues that alleged irregularities with the nation’s 2018 election render Mr Maduro’s leadership illegitimate. Mr Maduro, who is backed by key economic allies including Russia, Cuba and China, says he is the legitimate president. He also warns that deliveries of foreign aid would open the way for US military intervention. What happened at the border on Saturday? Venezuela’s opposition had intended to peacefully bring aid trucks over the borders with Brazil and Colombia. Mr Guaidó had pledged that the aid would come into the country on Saturday. In response, Mr Maduro partly closed the country’s borders. Venezuelans civilians attempted to cross in order to get to the stores of food and medicine, but the attempt quickly descended into bloody violence. Soldiers opened fire against civilians, using a mixture of live ammunition and rubber bullets. At least two people including a 14-year-old boy were killed, human rights groups said. There were also reports that some aid stockpiled on the border had been burned. Mr Pompeo described the reports as “sickening”. At least 60 soldiers had defected by late Saturday, according to Colombia’s migration service, but most of the military appeared to still be loyal to Mr Maduro. 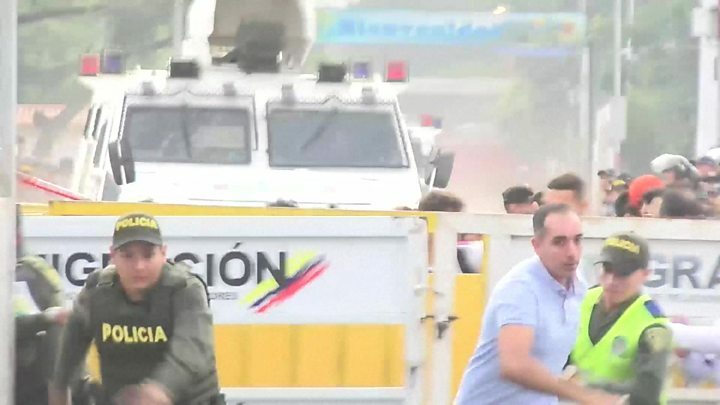 Video footage showed Venezuelan soldiers crashing their armoured vehicles into the border with Colombia in order to defect. Another video posted on social media appeared to show four soldiers publicly denouncing the president and announcing their support for Guaidó. Mr Guaidó promised the defectors amnesty if they joined the “right side of history”. Late on Saturday, Colombia’s government estimated the number of injured at border crossings to be about 300. 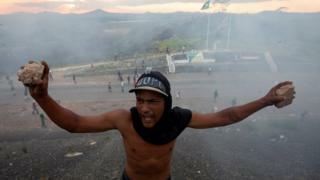 Amnesty International described the use of live ammunition by Venezuelan troops as a crime under international law. President Maduro has ignored international calls to hold new elections. He has accused Mr Guaidó of being an “American pawn” and an “imperialist beggar”. As protests got under way at Venezuela’s borders, Mr Maduro staged a rally in Caracas. “Take your hands off Venezuela, Donald Trump,” he told a cheering crowd. Genuine aid or a Trojan horse? The US is leading the international effort to pressure Mr Maduro, and has implemented a raft of financial sanctions against his government. The humanitarian aid stockpiled in Colombia and Brazil is at the centre of a stand-off between Mr Maduro and Mr Guaidó that goes back to Mr Maduro’s disputed re-election in 2018. For several years Venezuela has been in the grip of a political and economic crisis. An out-of-control inflation rate has seen prices soar, leaving many Venezuelans struggling to afford basic items. At least 2.7 million people have fled Venezuela since 2015.